I first met Terry Wrigley on the floor of a tattoo convention. If memory serves me correctly, it was either in Houston in 1976 or Reno in 1977. From that time forward, every time I was at a convention, I would ask about Terry or look to see if he was there. Usually he would be found with a drink in hand, a ready smile and great stories to share. Tattooing since the early 1950's. Terry was an outspoken advocate for tattooing. 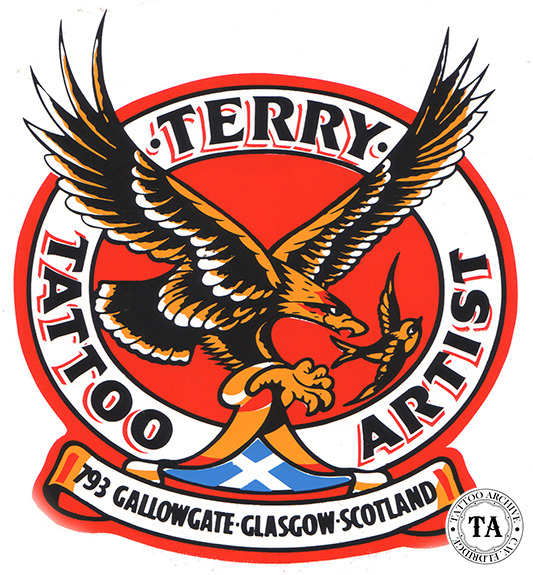 Through the years Terry was involved with many tattoo clubs around the world and was beloved in the business. "TERRY WRIGLEY (TCA 178), #20 Micklehurst Road, Mossley, Ashton-under-Lyne, Lancs. England. 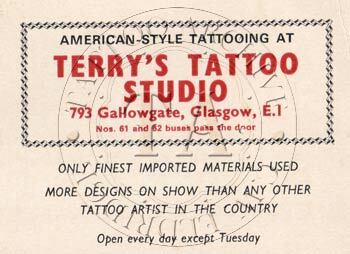 Terry took interest in tattooing at an early age. Later on when attending art school, he was expelled for drawing tattoo designs instead of studying "more serious subjects. 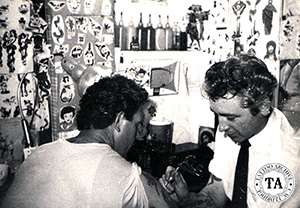 One Sunday in 1950 when in the Army at Ismailia, Egypt and driving to church he preferred to look around for a tattoo shop instead of attending the service, and got his first tattoo. He watched the artist for hours and decided to become a tattooer himself. He returned to his unit with a small bottle of black ink and three needles stuck into a piece of cork. He started to tattoo on his fellow soldiers and later built his own machine. Then he was transferred to Germany where he tattooed thousands of British, Dutch and Belgian servicemen. He often went to the nearby city of Bielfeld, where Hans Ullrich was tattooing with his two sons as if on an assembly line, and Terry helped him. After his separation from the service he opened a studio in Ashford, Kent, but soon moved to Ashton-under-Lyne where he has worked ever since. Terry seems to do good work according to the numerous newspaper articles, which he sent us. The latest fad among Terry's customers is to have two symmetrical small designs tattooed on their necks, mainly birds. A large part of Terry's tattoos were done by Basil Jarvis." 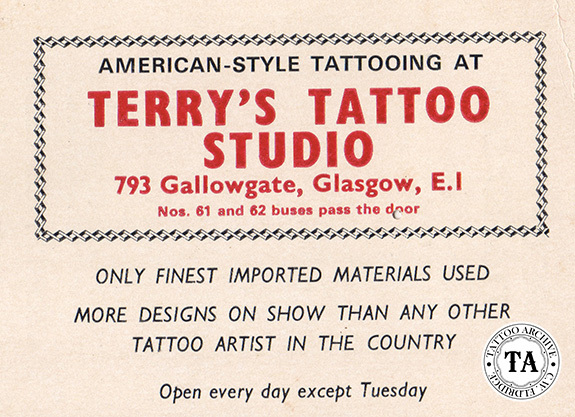 After this was published in the TCA newsletter Terry moved to Glasgow, Scotland where he worked in two different locations; #793 Gallowgate and later at #23 Chisholm Street. Today his family runs this shop and I'm sure it will remain a landmark in tattooing for many years to come.